I read that one can generate electricity from flowing river without damming the area and destroying the ecosystem within the hydropower plant. You just need a little bit of head to turn the turbine. There is a power generator system called run-of-the-river hydropower that researchers and investors found to have emerged as a viable, and is a low-impact alternative to existing large-scale projects. Low head run-of-the-river and flow-with-the-water system: What are they? Run-of-the-river facilities use conventional hydropower technology to produce electricity but in this method, the river flow is diverted through turbines that spin generators, then water is returned back to the river downstream. A 3 m to 4 m head created by the weir. Picture was taken during rainy season when the river swelled. In a worse but rare flood condition, the water channel on the foreground become completely submerged. In this case, you can perhaps put water wheels or a series of helical wheels across the weir. Or, install several Gorlov helical turbines along the water channel. You can read about Gorlov helical turbine (GHT) here. Wider view of the water intake, located near one of the government water treatment plants along Tuaran River. This was shot during dry season. 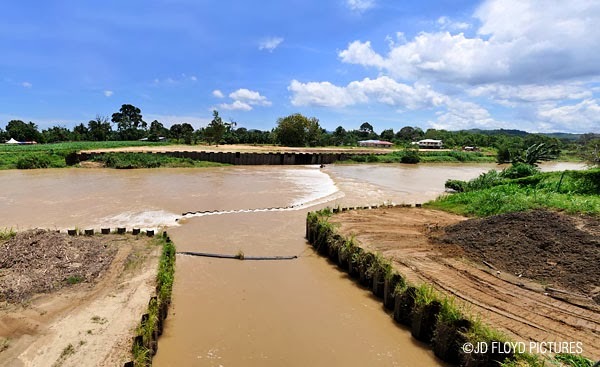 This obviously falls under the jurisdiction of the several government agencies such as Department of Irrigation and Drainage, Department of Water Supply, and Tuaran/Tamparuli Municipal Council. But it is pretty interesting to see if one can find a way to tap energy from the flowing water. To certain extent, I would be able to tag along and help anyone interested to study the potential of this river. If you are equipment supplier, system integrator, or project consultant with some spare time, or you are someone on the look out for new things, you may want to have a look at this. Interested? Then pay this site a visit. Is that the picture of Telibong WTP? 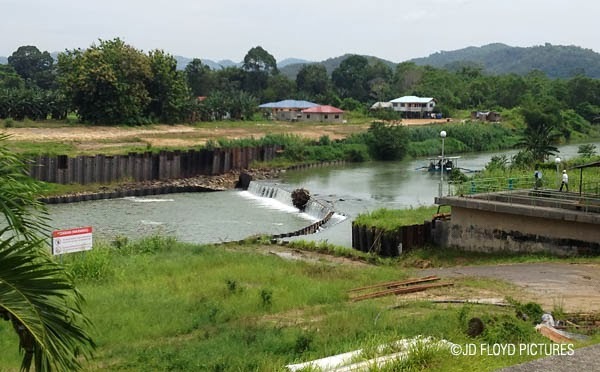 The government has four water treatment plants along the river spanning from Tamparuli to Tuaran town. It is true, it's not easy, or rather not straight forward. But it is also true that this can be done with proper homework. We'll never know its viability until we make some study.